VersaPeel® is an effective, no-downtime detoxifying gel peel that helps to reduce acne breakouts, pore size, wrinkles, pigment, improve skin tone, texture and overall skin complexion. Our proprietary MicroFlake® technology ensures optimum skin cell turn over without visible shedding of skin in under 5 minutes. If you are seeking a natural wrinkle reducer or natural remedies for hyperpigmentation or acne then look no further! Joanna Walters, Esthetician in Florida uses VersaPeel for Aging Skin, Acne, Pimples, Melasma and hyperpigmentation. She loves that it is quick and effective and can be done at the medical aesthetician level and at home to continue seeing benefits. The formula is rich with acids that help to exfoliate the skin, penetrate deep in to the skin layers and reduce P bacteria at the layer where pimples form. Our proprietary blend of ingredients includes three skin lightening ingredients that help to reduce dark spots, melasma, hyperpigmentation and acne scarring spots. It is used widely for acne, aging and skin brightening. This miracle worker helps to deliver supreme skin lightening benefits while exfoliating and rejuvenating new skin cells. It helps to assist in skin lightening, reduces dull and uneven skin tones, scars, pigmentation, blemishes, and enlarged pores. Using VersaPeel helps to reveal clear, radiant, and glowing skin. VersaPeel is an optimizer, recommended for use 1-2 days a week while using a PriyanaMD regimen with products such as vitamin CE Ferulic Acid Serum or our Protein Packed Growth Factors called HylaCell. 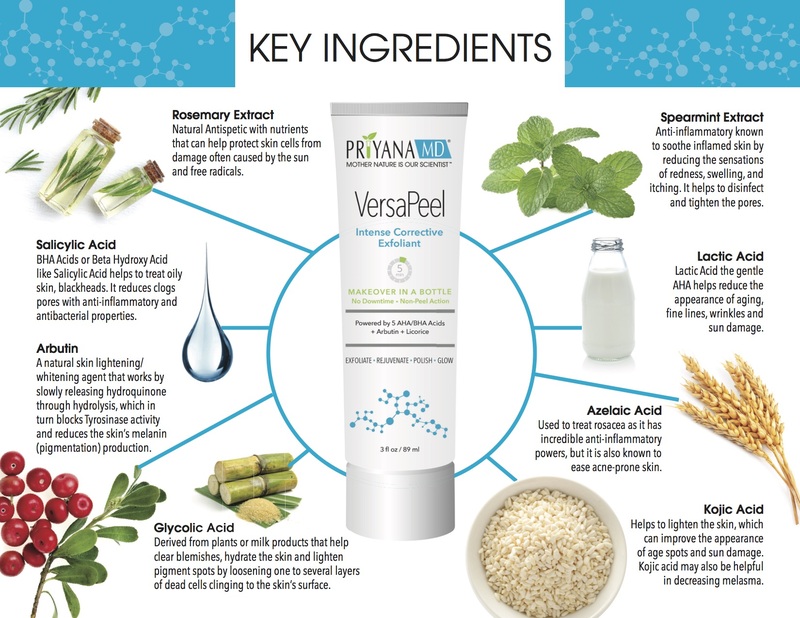 VersaPeel is a natural exfoliating gel and the key to using exfoliating products, such as VersaPeel or VersaCleanse is to remove dead skin cells on the surface and allow your other products to penetrate deeper so they can work better and help to achieve better outcomes. Our Microflake Technology mimics a medium-intensity peel, while hyperlapsing 30-min peel into under 5 min with micronized shedding of dead skin cells. VersaPeel is formulated to exfoliate the stratum corneum, the very outer of skin that is comprised of 3-4 layers of dead cells. Once applied, VersaPeel desquamates (exfoliates/sloughs off) in Microflake non-visible dead skin and stimulates the new skin lying just beneath the surface. Our multi-part Alpha Hydroxy Acids/Beta Hydroxy Acids advanced delivery system at a specific Ph enables deep penetration into acne-prone and aging skin without the side effects of peeling. As we age, cell sloughing becomes more difficult, resulting in skin that appears dull, thicker and less toned. Exfoliation is vital to skin health and beautiful skin. Removing this build-up of dead, damaged cells stimulates the regeneration of new cells, improving the skin’s appearance, feel, and texture. Doctors and practitioners use VersaPeel for neurotoxins (i.e., Botox) and dermal fillers / injectables (such as Juvederm, Sculptra, Restylane, and Radiesse). Practitioners generally prep the skin with VersaPeel for two minutes prior to the injection. Body: VersaPeel is also used by aestheticians to prepare patients’ skin for CoolSculpting and other body-related treatment modalities. Call us today for a complete facial and body protocol sheet for VersaPeel.Adding VersaPeel to your professional menu will ensure patients have the best treatment and leave your office with radiant skin. Face and Hands: Apply to clean, dry skin and follow the time chart. Skin will intensely tingle when applied. Apply product with a brush applicator or fingertips avoiding any open skin or wounds. Rinse, remove and pat dry. Water may cause a tingle sensation as you remove. Do not apply product close to the eye. Daily sunscreen required. Caution: This product contains Salicylic Acid, an Aspirin derivative. Do not use if you have a known allergy. Discontinue use and contact emergency if you have signs of an allergic reaction hives, itching, difficult breathing, swelling of face, lips, tongue or throat. Keep out of reach of children. Do not have any laser, hair removal or wax treatment within 72 hours of using VersaPeel. Do not apply a derivative of Vitamin A or Retinol directly after using VersaPeel® as your skin will be more sensitive. Do not use this product if you have Rosacea, Pregnant or Breastfeeding. I tried this products just twice now and saw immediate results. It made my skin smooth, soft and overall younger looking. I am amazed and highly recommend it! It does sting a little, but don't be afraid, it'll look good in the end. Great for oily, acne, wrinkle skin and skin lightening! This product is successful in my practice. I recommend it!